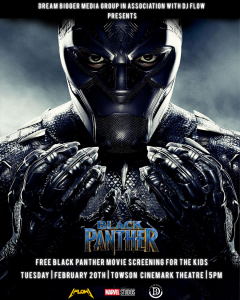 Baltimore Rapper Brings Kids to “Black Panther” for Free Damond Blue has rented out three theaters for Baltimore kids to see the already-iconic film. Thanks to local rapper Damond Blue, nearly 200 children in the Boys & Girls Club of Metropolitan Baltimore will be able to see “Black Panther” in its opening week. Damond Blue, in conjunction with his foundation Beats Not Bullets and the Bigger Media Group, has bought out three theaters (182 seats) at the Towson Cinemark Theatre for the children to watch the film. They will also receive free popcorn and soda. “Black Panther” is being celebrated for its nearly all-black superstar cast and proud Afrocentrism. The character of Black Panther was the first black superhero to be introduced and is the first to star as the main character in a Marvel movie.